Why should the seasons of spring and summer get all the fun when it comes to hanging baskets? 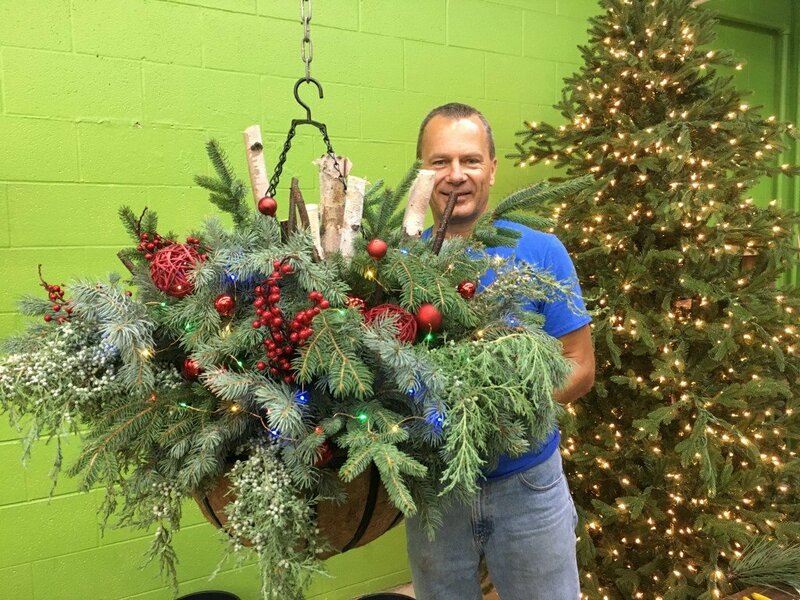 A holiday basket can be made incorporating materials from the landscape along with some ornamentation to make a hanging display for porch or patio. The arrangements are a unique and festive welcome to guests who arrive and an enjoyable everyday sight for you. View from indoors looking through the window as it hangs in an entryway or on a deck. 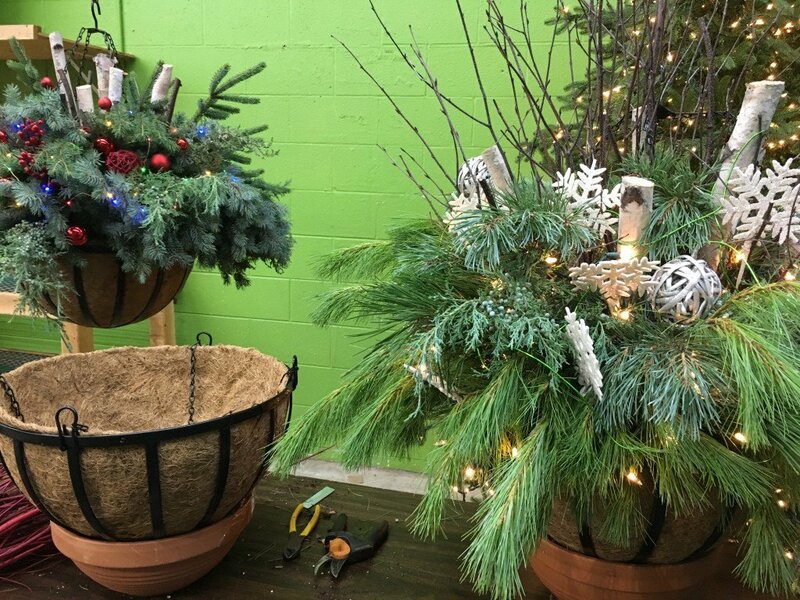 These holiday baskets use natural materials featuring aromatic boughs of evergreen. The gift that keeps giving they are inviting and attractive from November through February. 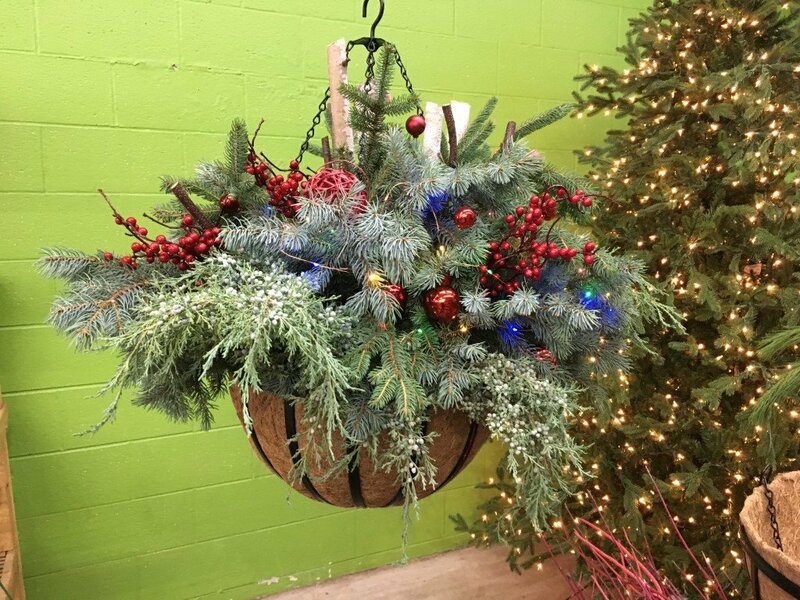 As Jack Frost adds his natural touch in the cold months the basket will glisten and dazzle. 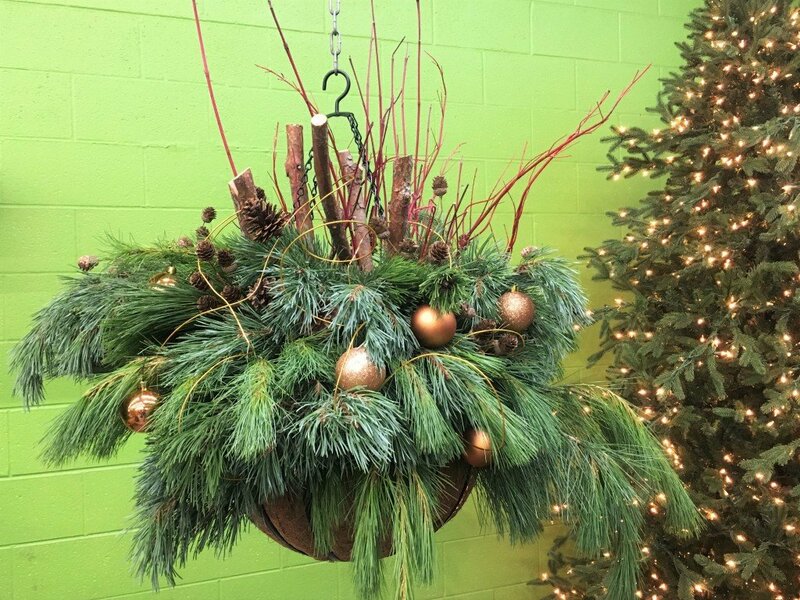 Their appeal and glitter is enhanced by the natural movement of a hanging arrangement versus a static pot or planter. 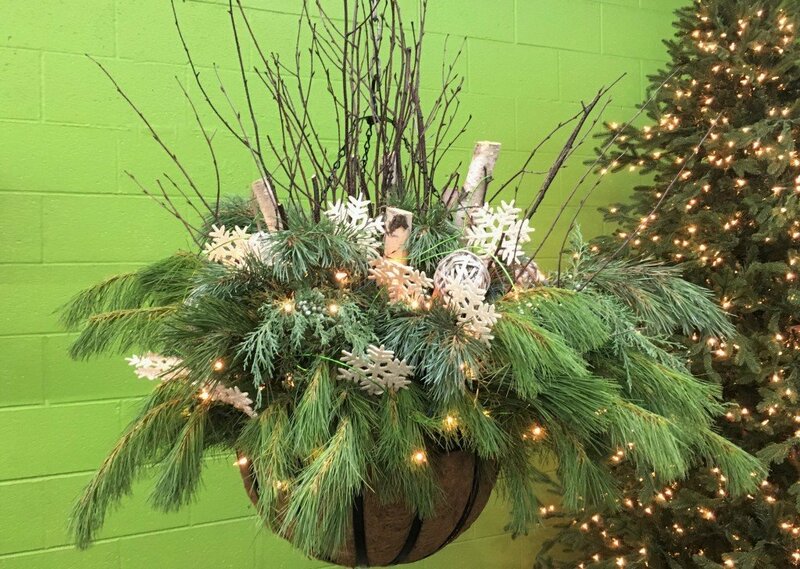 Place the basket to be arranged in a pot on a table to make arranging easier. Light weight potting soil is added to the hanging basket first to provide the foundation for the stems and branches. Once placed outside this is the soil that will freeze and hold the branches and stems in place for months. 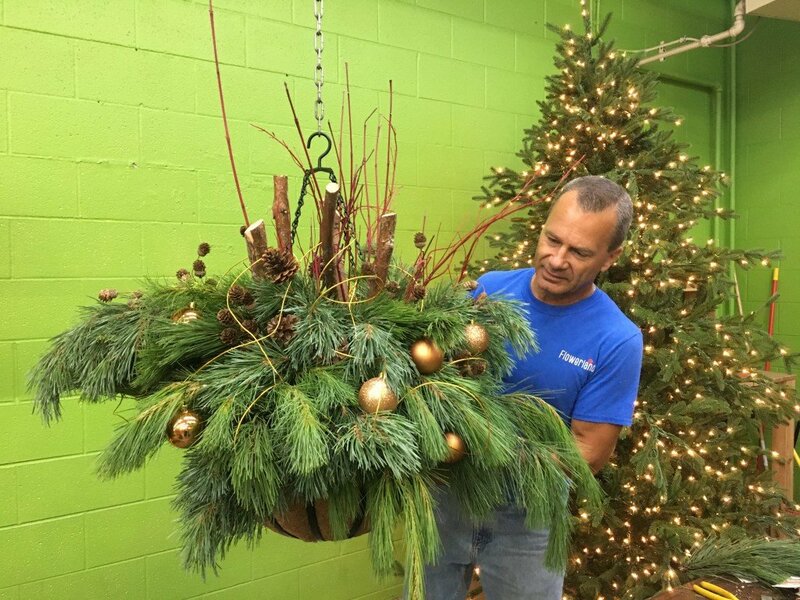 This basket will “spruce” up the place! Finally comes the ornamentation portion of the project giving the basket your personal touch. Pine cones or Berry stems provide a natural means of ornamentation. Unbreakable plastic color ball ornaments can be wired to the branches using multi-color or a themed single color. Florist wire available in many bright colors is easy to work with and can weave throughout your arrangement adding additional interest. The addition of LED lighting in the basket will make it glitter in the nighttime hours, especially when nature adds the frosty touch. LED lights are available in miniature so they subtly add to the feel of the basket without sticking out. You can avoid outlets or extension cords by purchasing some battery operated sets to nestle between the branches or your basket.